BALI, Indonesia—Socialight recently collaborated with P.T. 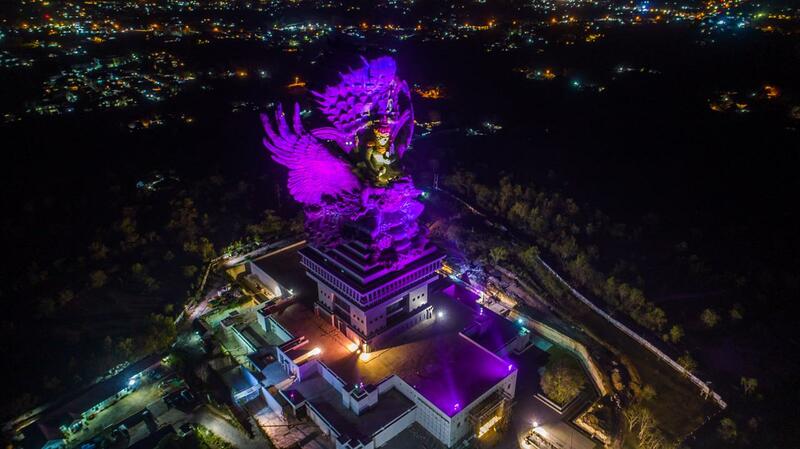 Chayolite to realize a state-of-the-art Martin by HARMAN lighting solution to enhance GWK Cultural Park’s beloved Garuda Wisnu Kencana statue. Created by renowned sculptor Nyoman Nuarta, the Garuda Wisnu Kencana statue is an iconic monument overlooking the city of Bali. Measuring 393 feet tall and 213 feet wide, the colossal statue consists of 24 segments and 754 modules, and took more than 20 years to construct. In order to visually enhance the unique and outstanding structure, Alam Sutera Realty engaged Singapore based lighting designer, Socialight to design and oversee the implementation of an architectural lighting solution. Socialight selected Martin Exterior Wash and Exterior Projection fixtures to illuminate the Garuda Wisnu Kencana statue, which was proficiently implemented by lighting solutions specialist, P.T. Chayolite. Because the Garuda Wisnu Kencana statue is made of copper and brass, Socialight faced the challenge of finding the best method to reflect the sculpture’s true color when illuminated. The installation team relied on a range of Martin Exterior Wash and Exterior Projection fixtures to achieve an optimum lighting effect that lets visitors appreciate the statue’s texture and physical appearance. Martin Exterior Wash 300 and Exterior Wash 310 fixtures provide powerful narrow beams to highlight the vibrant hue of the statue. The installation benefits from the Exterior Wash’s uniform color-mixing and six flexible beam angles. Additionally, Socialight included Martin Exterior Projection 1000 fixtures with CMY color-mixing to supplement the Exterior Washes with spectacular high-contrast colors and atmospheric animation effects. The Exterior Projection 1000 features weather protection and low-energy consumption, making it the ideal fixture for an outdoor architectural installation. “With the goal of creating an immersive visual experience, our team designed a solution to transform the space around the Garuda Wisnu Kencana statue into a bright, compelling sculpture where visitors can appreciate the intricate details of the beautiful statue,” said Rohan Abdullah, Director, SociaLight. “Because Alam Sutera had very strict requirements regarding the statue’s lighting installation, we selected Martin fixtures for their versatility and reliability. The Martin fixtures made it easy for us to draw on our experience in event lighting and apply it to the architectural lighting application. Garuda Wisnu Kencana statue is so unique in its design and use of color, and the Martin fixtures were perfect for matching the lighting to the statue’s intrinsic colors.